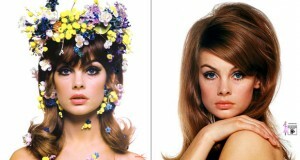 Jean Shrimpton was an English model who started modeling in 1960 aged 17 and soon became worldwide known as “the shrimp”. She had an affair during 4 years with famous photographer David Bailey who made her one of his favourite models in “swinging London”. Twiggy was born in 1949 in a London suburb. She became a worldwide famous model in the mid sixties with the coming of the controversial miniskirts in the “swinging London”. She looked very special with her boyish short haircut, her black eyelashes and her very thin body.